The Can-Am Maverick X ds side-by-side vehicle features a completely new rear end providing a longer, 88-in (223.5-cm) wheelbase, a redesigned TTA rear suspension now featuring 16 in (40.6 cm) of travel and Can-Am exclusive high performance FOX shocks to provide capability, comfort and adjustability. This model soaks up terrain and remains nimble. It is tailored to fit riders and their riding style with its premium rider-focused cockpit and ergonomically positioned controls and adjustments. 101-HP ROTAX 1000R V-TWIN ENGINE AND DUAL EXHAUST: The 976cc, 101-hp Rotax® 1000R V-Twin engine supplies reliable, thrilling power. This liquid-cooled, single-overhead-cam power plant features four valves per cylinder and is fed by a 54mm Bosch® throttle body and two sophisticated VDO Siemens® fuel injectors. The dual exhaust uses tuned manifold lengths and resonator chamber to create more flow. A catalytic converter ensures optimal combustion both from a performance and emission standpoint. HIGH-FLOW DYNAMICS: The Maverick 1000R X ds is built around that concept starting with large intake plenum and high-flow heads working together to optimize the air going to the engine. Efficient combustion is achieved by joining large valves to a high compression ratio. A high-flow, dual exhaust completes this powerful engine design. CVT TRANSMISSION WITH ZYLON-REINFORCED BELT: The Continuously Variable Transmission (CVT) showcases a Zylon-reinforced belt, a material with 1.6 times higher tensile strength and increased belt rigidity in compression compared to a regular belt, keeping it cooler. It also features an integrated engine braking system that will help maintain a steady speeds when descending hills. INTELLIGENT THROTTLE CONTROL (ITC): The electronic throttle-by-wire system works in conjunction with the 54mm Bosch® throttle body to produce a smooth delivery, even if the drivers foot is bouncing due to rough terrain. The iTC system, which includes a progressive and Sport modes, de- tects unwanted bounces and filters the input. This system also reduces the number of moving parts in the vehicle; requires no maintenance; has no cables to adjust, lubricate, or replace; and the system has an increased life span. Low mode on X ds Turbo models is aggressive and more linear. 10-GAL. (37.8L) GAS TANK: With its large 10-Gal. (37.8L) fuel tank and efficient fuel consumption, the Can-Am Maverick lets the driver focus on riding and less on refueling. RECONFIGURED TORSIONAL TRAILING A-ARMS (TTA) REAR SUSPENSION WITH 16-IN. TRAVEL: The innovative Torsional Trailing A-arms (TTA) rear suspension system, which was completely redesign for dune and desert application, now offers a full 16-in. (40.6cm) of travel to provide a smooth ride at a hard-charging pace and in technical ter- rain. The compact version of a five-link suspension offers no bump steer and low scrub. This all translates to a more controlled wheel movement, optimal bump absorption and tire-to-ground contact for predictable handling. A compact design also means low unsprung weight for quicker suspension reaction to changing terrain. Along with the new FOX shocks, the rear suspension system offers a perfect balance of confidence at high speeds and the agility and nimbleness of a true sport vehicle. EXCLUSIVE HIGH-PERFORMANCE FOX 2.5 PODIUM RC2 PIGGYBACK REAR SHOCKS: The Maverick X ds family is equipped with Can-Am exclusive FOX 2.5 Podium RC2 Piggyback Shocks for superb capability, comfort and adjustability. The rear shocks feature Dual-Speed Compression (DSC), rebound and dual-rate spring with infinite preload adjustments allowing to fine tune the system for any driving style, terrain or course conditions. A position-sensitive Bottom-Out Control and a spring crossover allow for less compression damping at ride-height to improve comfort and traction while giving huge damping at the end of the stroke to flatten out the biggest of bumps. Aluminum body and reservoir improve heat dissipation for less fade and reduced weight. The 7/8-in. shaft gives the rear shocks a lot of additional strength and buck- ling resistance to handle the most demanding conditions. The rear suspension systems work in tandem to allow the Maverick X ds to float over rough terrain and maintain a straight line while doing it. REDESIGNED DOUBLE A-ARM FRONT SUSPENSION WITH 15-IN. TRAVEL: The redesigned double A-arm front suspension features 15-in. (38.1cm) travel for a capable and precise ride. EXCLUSIVE, HIGH-PERFORMANCE FOX 2.5 PODIUM RC2 PIGGYBACK FRONT SHOCKS:The front shocks feature a 5/8-in. shaft, 2.5-in. aluminum body and 2-in. aluminum reservoir. They also offer adjustable dual- rate spring preload, Dual Speed Compression (DSC) adjuster and rebound adjuster for custom settings. The large-diameter bore allows for greater damping force capability, while allowing the shock to run at lower overall temperatures, offer less fade and more consistent damping. REVISED FRAME WITH 88-IN. WHEELBASE: The Maverick X ds family has a revised frame, including a modified rear subframe, center rail and a few tweaks to the front end. The result is a 3.7-in. (9.4cm) longer 88-in. wheelbase. The longer wheelbase supplies a more comfort and a confidence- inspiring ride at higher speeds. MID-ENGINE LAYOUT: Competitive side-by-side vehicles feature engine layouts toward the rear of the vehicle that can increase inertia and a tendency to over steer. The Maverick engine, centered between the two seats, centralizes weight for more agile steering and easier corner- ing. The result is a nimble Maverick that is maneuverable, predictable and quick to react to direction changes. 13-IN. (33CM) GROUND CLEARANCE: The Maverick has a 13-in. (33cm) ground clearance for optimum performance in challenging terrain. The suspension and frame were engineered to produce a vehicle that can tackle rugged terrain in predictable fashion while also remaining precise in aggressive cornering. 32MM HYDRAULIC DISC BRAKES: The Maverick X ds vehicles are outfitted with 220mm disc brakes with 32mm twin-piston calipers up front and 214mm and 32mm single-piston calipers in the rear for excellent stopping force. NEW 14-IN. ALUMINUM BEADLOCK WHEELS WITH 28-IN. MAXXIS BIGHORN 2.0 TIRES:The new beadlock wheels with performance tires are designed to be lighter for low unsprung weight. The mechanical fastening beadlock system makes it nearly impossible for the tire bead to break loose from the wheel during heavy acceleration or corner- ing. Larger 28-in., 6-ply Maxxis Bighorn 2.0 tires, which feature sturdy lugs and a non-directional tread pattern, offer a smoother ride over a variety of surfaces. TRI-MODE DYNAMIC POWER STEERING WITH QUICK-RATIO STEERING: The Maverick 1000R X ds models feature Tri-Mode Dynamic Power Steering (DPSTM) with three selectable modes (MIN, MED and MAX) of steering to adapt to drivers preference. Each mode is designed to offer less assistance at high speed for better precision and more assistance at low speed for easier steering. Matched with a revised quick-ratio steering system that has a reduced the ratio from lock-to-lock the Maverick X ds offers a shorter turning radius. VISCO-LOK QE AUTO-LOCKING FRONT DIFFERENTIAL: Exclusive to Can-Am, Visco-Lok QE is an automatic locking front differential that reacts quickly to wheel slippage by trans- ferring power to the wheel with traction. This front differential allows real, continuously engaged four-wheel drive to transfer maximum torque to the ground at any moment. The Visco-Lok QE will deliver power without any speed or rev limiter pulling you through whoops and bumps. The fully engaged front end means steering stays light and manageable and offers precise cornering and agile maneuverability. RIDER-FOCUSED DESIGN RIDER-FOCUSED COCKPIT WITH PREMIUM FIT-AND-FINISH:Experience high-end comfort in the Maverick X ds cockpit. It features a premium fit-and-finish, race-inspired bucket seats with full backrest, lumbar and shoulder support and side bolsters to supply a snug fit for driver and passenger during aggressive riding. A fully adjustable drivers seat and 10-in. tilt steering adapts to any rider in an instant with tool-less adjustments. Ergo- nomically positioned passenger handholds and class-leading cockpit space also provide full comfort expected from no one else than Can-Am. The Maverick X ds models have a convenient, versatile 4.5-Gal. (17.2L) glove box. Attention to detail and bold, exclusive colors give the Maverick X ds vehicles a level of sophistication thats unparalleled in the industry. 2-IN. DIAMETER, HIGH-STRENGTH STEEL, ROPS-APPROVED CAGE: The Roll-over Protective Structures (ROPS) industry standard was followed when designing the Can-Am Maverick family of side-by-sides 2-in. diameter, high-strength steel cage. The X ds line of Can-Am vehicles wears its own unique Manta Green color-matching ROPS. MULTI-PURPOSE REAR RACK WITH LINQ QUICK-ATTACH: The Maverick X ds rear rack works with the LinQ quick-attach accessory system, letting you easily install or remove a storage box, rack extension, bags or other items. Numerous edges and holes improve use with tie-downs and bungee cords. Has a 200-lbs. (91kg) rack capacity. NEW ALUMINUM FRONT BUMPER: Inspired from our Can-Am desert racing efforts, a lightweight, aluminum front bumper on the Maverick 1000R X ds is as stylish as it is protective. ANALOG/DIGITAL GAUGE AND CUSTOM STEERING WHEEL: The gauge features state-of-the-art instrumentation with an analog tachometer and speedometer combined with an advanced digital information centre. The LCD gauge, which offers a speedometer, odometer, clock, trip meter and more, is mounted to the steering column so it adjusts with the steering wheel and stays within the drivers sight lines. Plus the three-spoke steering wheel is outfitted with molded grips and a brushed aluminum centrepiece to add to the high-performance style. 625-W MAGNETO: This package provides a more powerful magneto with 625-W output. Whether it is to install a high-performance lighting or a ground-shaking sound system, this larger magneto can handle it. 240-W LIGHTING SYSTEM: The Maverick X ds family of side-by-side vehicles has the industrys best lighting system at 240-W. Automotive-style projectors, on each side, run at 120-W in low beam and 240-W in high-beam mode. D.E.S.S. STANDARD ANTI-THEFT SYSTEM: D.E.S.S. is the industrys first standard anti-theft device. The electronic code in the key must match the code in ECU to start. The Maverick X ds family comes with two different keys. One limits top speed to 44 mph (70 km/h) and the other has no limitations. EXCLUSIVE COLORATION: The Maverick X ds and Turbo X ds have their own new and exclusive bold colorations. The Maverick 1000R Turbo X ds features Can-Am X-Team-inspired graphics and sponsor logos and comes in two exclusive, bold color packages: White / Light Grey / Manta Green and Carbon Black / Manta Green finishes. The X ds (non-Turbo) is available in its own exclusive White / Black / Manta Green coloration. Both units have color exclusive seats with premium stitching, X logos and color highlights as well as the color accents on the suspension, beadlock wheels and cage add to the style and the fit and finish of the Maverick. 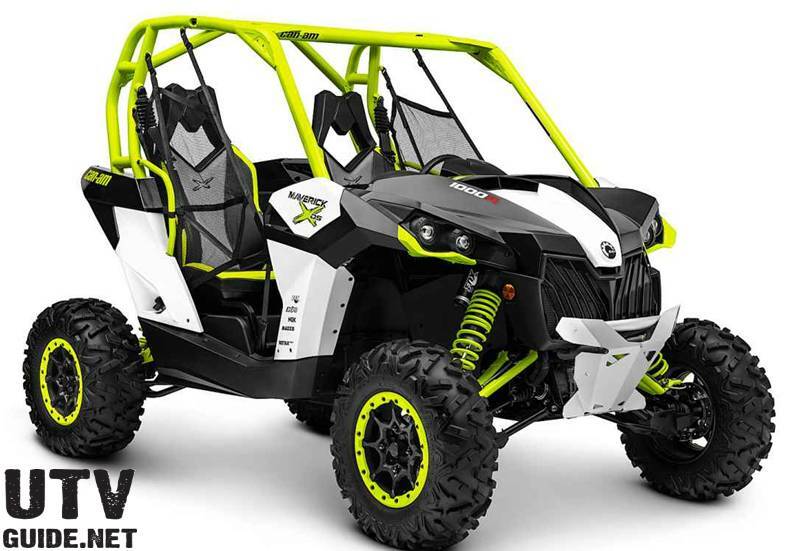 GENUINE CAN-AM ACCESSORIES: Many genuine Can-Am accessories are available to allow you to customize the Maverick X ds vehicles to your personal needs, riding style or terrain.